The health benefits of drinking red wine in moderation are well-documented. Certain compounds in wine can offer protection from damaging free radicals and inflammation. But is there a link between hearing health and red wine? Red wine consumption may help you maintain healthy hearing, with one caveat. Because red wine contains alcohol, moderation is the key. It ensures you’ll reap the benefits without causing more damage. 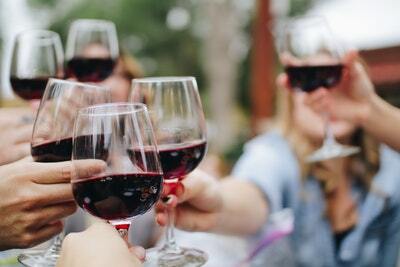 To learn more about hearing health and red wine consumption, read on. Hearing loss is no small issue. It can greatly affect a person’s overall health and well-being. To understand how red wine may help prevent hearing loss, it’s essential to know what causes it in the first place. Age-related hearing loss can be caused by a number of factors, but it’s often due to the damage of hair cells and degeneration of structures in the ear. When damage accumulates, it often requires the best hearing aids to be able to hear. Cochlear hair cells are tiny nerves that line the inside of the cochlea, a snail-shaped structure within the ear. Each hair cell picks up a different sound in vibration form. They all work together to transmit these vibrations into signals to the brain. Damage to cochlear hair cells is most often caused by repeated exposure to loud noises. While hair cell damage was once thought be from a mechanical bending and breaking of these cells, the picture is much more complex. Loud noise causes an increase in harmful free radicals in the cells and tissues of the inner ear. These free radicals are the result of sharply increased mitochondrial activity in hair cells upon loud noise exposure. In addition to spiking free radicals, noise exposure reduces blood flow to the cochlea and induces cell death within the ear. Without preventative measures, these cells are left unprotected and do not regenerate once they are damaged or killed. Nerve cell swelling within the ear is also caused by noise. Loud noise greatly increases the excitatory neurotransmitter glutamate. Glutamate normally converts vibrations into electrical signals to be received by the brain. Noises that are too loud, however, cause excessive glutamate production. This glutamate flooding is toxic to hair cells within the ear. It’s also toxic to other nerve cells in the brain and brainstem’s auditory and somatosensory systems. Chronic inflammation may also play a role in hearing loss. Inflammation prompts a cascade of chemical reactions body-wide. These reactions can damage vulnerable cells, including those in the ear. This can adversely affect your hearing health. The link between free radical damage and age-related hearing loss has become more clear in recent studies. Free radicals are the byproduct of cell metabolism and can be neutralized by antioxidants. Free radicals cause oxidative stress in the body. This oxidative stress occurs when oxygen inside the body is split into single atoms. Single atoms of oxygen have unpaired electrons. Since electrons prefer to be in pairs, these atoms will seek out electrons in the body. Free radicals “take” electrons from molecules in the body to complete their electron pairing. The result is damage to DNA, important proteins, and cells. Free radicals prompt a dangerous domino effect. Every molecule they alter by taking electrons essentially changes that next molecule into an electron-seeking free radical itself. This is called molecule destabilization. It can damage every cell component until a cell is destroyed or worse, becomes dangerous. Antioxidants are the body’s defense against free radicals. They are molecules that prevent free radicals from damaging important cellular molecules. Antioxidants do this by giving electrons to free radicals while remaining stable themselves. This effectively prevents cell damage and halts the domino effect of free radical destabilization. Our bodies are able to produce some of their own antioxidants, but not enough to neutralize all free radicals. This is especially the case in the modern world where noise and pollution are everywhere. To get an adequate amount of antioxidants, diets high in fruits, vegetables, and nuts, plus supplementation, can help. So what role does red wine play in the protection of hearing? Red wine contains a special compound that acts as a free radical scavenging antioxidant. Resveratrol is a polyphenol compound found in high concentrations in the skin of red grapes. Because it is made from red grapes, red wines have a high concentration of this antioxidant as well. In addition to free radical cleanup, resveratrol activates special proteins in the mitochondria of cells. This activation leads to increased new mitochondria. This is important because mitochondria are the organelles inside body cells that orchestrate many metabolic processes. Reservatrol’s effect on mitochondrial numbers comes full circle to free radical control. Unhealthy, older mitochondria are inefficient and produce more free radicals than healthy mitochondria. Protecting and renewing these organelles reduces free radical load, consequently reducing damage, abnormal cells, and inflammation. Resveratrol also plays a crucial role in the nitric oxide cycle. Nitric oxide is a molecule that acts as a chemical signaling system for the nervous, vascular, and immune system. Resveratrol boosts the activity of two beneficial types of nitric oxide and suppresses one other type. This leads to better nervous and cardiovascular function. Ultimately, it ensures better blood flow to the hair cells and inner structures of the inner ear. The resveratrol in red wines can be beneficial to your hearing health. However, only moderate consumption gives you benefits without risks. To stay within a healthy range, women should limit their consumption to one 5 ounce glass a day, while men can have two. Repeatedly drinking too much can damage auditory processing areas in the brain, making hearing loss worse. Always stay within the recommended limit for wine consumption. Even if you have some hearing loss, you can improve your hearing health with good habits and resveratrol. Enjoy your red wine in moderation for optimal hearing benefits. Have you experienced significant hearing loss? If you would like to know more about your hearing aid options, explore our website today.